January 1st is my favorite holiday. I love fresh starts. It's probably why I love the idea of back to school...new notebooks, new pens and pencils, new crayons...what's not to love? There is so much possibility. And this year is no different. I have so much excitement and eagerness for all good things in 2015; but for the first time, or at least the first time that I notice, there's an energy field that is pushing in against my bubble. I never would have labeled myself as someone with anxiety. I can recognize joy, fear, sadness, anger...whatever life throws; but over the last six months or so, I have noticed anxiety, manifested through shallow breaths, unexpected gasps for air, edginess, insomnia and a heightened sense of restlessness. I find myself unable to make decisions, overwhelmed with choices, and projects left unfinished. My husband attributes my indecisiveness to my Gemini personality, but it feels like more. I will be 44 this year, and perhaps, realizing my mortality for the first time. I am noticing that I don't have enough time to do everything I want to do. I don't feel like what I once thought my 40s would be like, but alas, I am almost 44. I am happier and more at peace than I have ever been, so this confounds me. And this brings me to my word to 2015. In past years, my word has come to me with relative ease. It served as a foundation for my resolutions and shaped my thinking and my choices for the year. But this year? Too many choices. So, in honoring where I am in this moment, I don't have one word, but more of a manifesto for my year. In 2015, I will create. I will create art in words and pictures. I will create opportunities to learn, through travel, classes, books, and conversation. I will create a strong, healthy body through my work at the gym and in my own kitchen. I will create meals that nourish, using real food and the time it takes to prepare it. I will create loving, deep, meaningful, stronger relationships with others and myself, protected from the sham of busyness. The greatest gift is time. In 2015, I will push through challenges...with fitness, with work, in my thinking, with difficult people, with ideas that no longer work, and with excuses. 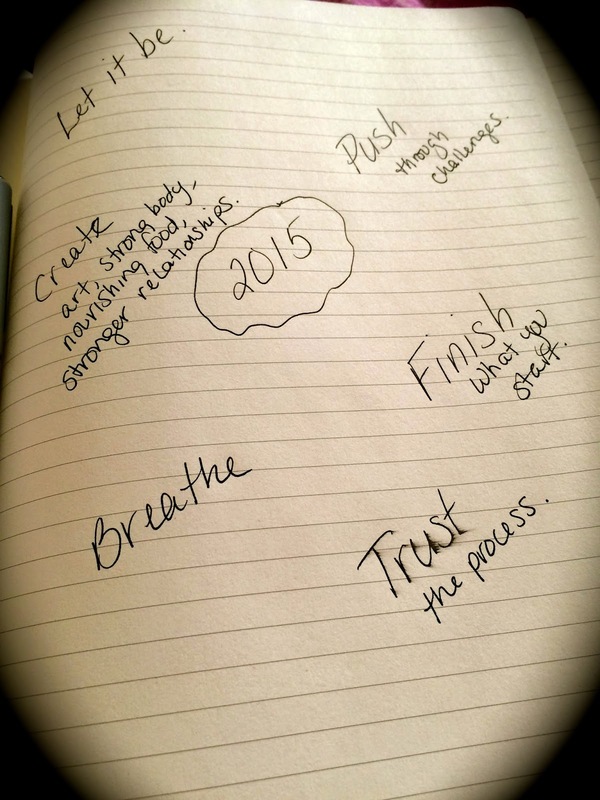 In 2015, I will finish what I start. I will apply my lesson planning process to my own projects. By the end of X, what will I be able to do/see, and how I will get there? In 2015, I will trust the process. I will put plans into action and trust that it will work out the way it is supposed to, and if it doesn't, the plan needs to be revised. And if it still doesn't, I have to trust that things happen for a reason; that it may take a different path or the result may look different that how I originally intended it to look. In 2015, I will breathe when I feel my anxiety rising. It will pass. Maybe it's time to seek out a yoga class. In 2015, I will let it be. I will not let negative energy contaminate my life. By honoring where my head is today, I acknowledge that I cannot narrow it down to one specific word. As the year progresses, my thinking could sharpen and I can revise. Every day is a new opportunity for a do-over. But for now, this is where I am. I love it!!!! You and I are on similar paths, as we've discovered! I also always joked that I became a teacher for the fresh school supplies each September! Cheers to 2015! We've got this! I LOVE THIS! I can never choose one word. There are many words I would love to live with and dig deep into during the year. This Manifesto is a great solution! I couldn't decide on a word this year either. But then I thought of the word Grow. It seems fitting for your list of feelings as well. Grow through your experiences, challenges, successes and failures. Grow by creating and traveling. And finally grow as a person to push past the negative and focus on the positive aspects in life. I know that is what I will be focusing on. Growing as an individual to become a better version of myself. I am 44 this year, a Gemini and anxious with life and too many choices. I must say you sound a lot more focused and calm about things than I do! I love all your goals and thoughts and may even have to adopt them, myself! accomplishments in these processes Kelly. Social media gives me anxiety. me. Last year I also struggled with being around people who bring me down, and others whom have always received my support over many years, but never offer even small encouragements in return. I am perhaps surrounded by too many very selfish people. My Sagittarian year in review, one point, in this year ahead will be closure and cutoff, scary, but part of my own manifesto, I feel personal changes ahead. Best Wishes and I'll be one of many cheering you on! Thanks, Angie. This year, one word was just too restrictive. Hopefully, this allows a bit more flexibility and opportunities to evolve. Good luck with your goals. Happy New Year! Thank you so much, Rosa. I look forward to reading it. Happy New Year! Thank you, Peggy. Social media is daunting. And as bloggers, it's important to be able to navigate these waters. Do what is comfortable. You are such a gifted writer and photographer...people come to you. Do what feels authentic. As far as closing off relationships go, I understand that a bit. People with narcissistic behaviors contaminate our lives. We can keep them at a distance or we can close the door. When they're acquaintances, it's easier, clearly. But when it's someone close, like family or formerly good friends, we have to determine whether we are able to maintain emotionally safe boundaries or whether it's best to say enough is enough and cut them off until they are able and willing to change their behavior. Muscles can hurt before they get stronger. Shells get tighter before they are outgrown. Sometimes tears can flow and wash away hurt. Growth comes with discomfort on some level, but in the end, it's evolution. We evolve into our truest selves, and that is worth it, in my opinion. Good luck, my friend. I will be sending you positive energy as you wade through these waters. Thank you, Carol. Please do. :-) Happy New Year! Louise, it comes and goes. After hitting publish, I needed to disconnect. I was tired and feeling anxious, but motivated. It's an ever burning fire. When the time is right, you will be able to focus. As my dad says, everything in time. Happy New Year! Grow is a great idea, Tracy. Evolve was my word a couple of years ago. As we grow, we evolve into our truest, best selves. What a wonderful way to shepherd ourselves through the year. Happy New Year! Thank you, Rebecca! One word was just too restrictive. Hopefully, this allows a bit more flexibility and opportunities to evolve. Thank you, Candace. I struggled with this for weeks. And after I published, I was exhausted, but motivated. I think working on it in small chunks will be important. Like a school project, mini deadlines, graphic organizers and drafts will help me get the job done. Cheers to 2015, indeed! Great words to live by. For now and any year! This sounds a lot like what I have been going through. I like that you didn't narrow it down to just one word, sometimes that just doesn't work. Sometimes you need to go with the feeling that works. 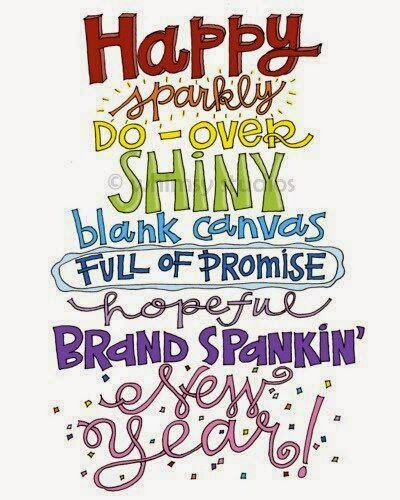 Hope 2015 brings you all that you hope for it to bring! You're a talented, strong, and determined woman. I know you can accomplish all this and more. :) I hope you enjoy the journey. Thank you, Traci. Coming up with coping strategies is key...trial and error. Happy New Year! This is so powerful, Kelly. I needed this. Thank you, Lynne. Happy New Year to you! Tara, thank you so much for sharing this with me. Knowing that others have similar experiences can be reassuring when life seems chaotic. Time is the greatest gift we give ourselves and others. Time for self is not selfish; it is so critical to how we care for others. Wishing you all the best in 2015. Thank you, again! I am always confounded by creeping anxiety when I feel at peace. I like how you've done this. Push resonates most with me, but breathe is typically my foundation. Breathe is great, but so is push. One challenges you; the other grounds you. Happy Sunday, Steph! Great focus for 2015. Happy new year...hope your favorite holiday was amazing! Thank you so much! I hope your 2015 is everything you want it to be. Cheers to fresh starts.